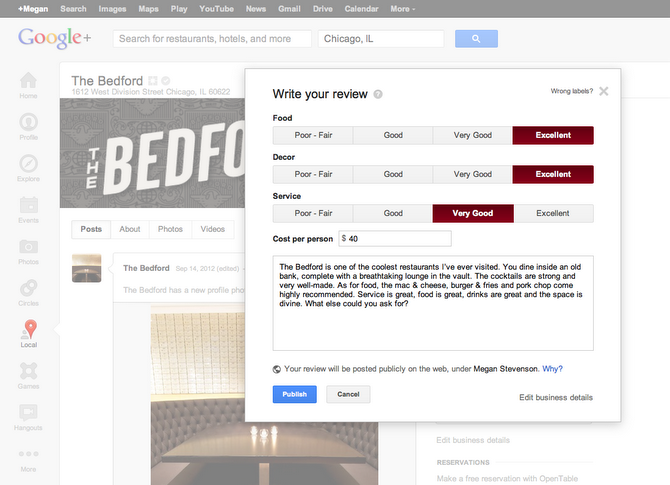 Google rolled out its own integrated, social review system for businesses with Google+ Local in May of this year. Not only was this a nice addition for Google+, but it finally utilized Google’s acquisition of Zagat. Having said that, I haven’t used the service all that much, because there are some usability issues there. The team seems to be working on some of those issues and rolled out some changes to how it asks you to rate a restaurant, for example. Rating systems are a pain, because you never really know what to say. For a 1 to 5 system, I often ask myself “is 5 really super awesome, or just good enough?” These are things that cloud these final ratings, making them not so useful for those who come along and read them. Google has decided to get rid of the number system for reviewing a venue and replaced it with a scale — ranging from poor to excellent — that makes a bit more sense. Google will then do the heavy lifting on calculating a useful score. Today it’s easier than ever to write accurate, useful reviews on Google+ Local, thanks to the updated rating scale we rolled out. If you want to rate the food at a restaurant, or the quality of a mechanic, just choose “poor – fair,” “good,” “very good,” or “excellent”. Behind the scenes, we’ll convert your ratings into numbers and factor them into the business’ precise 30-point score that shows up in Google+, Search and Maps. Give it a try! Click on the Google+ Local icon in the left navigation bar, search for a local spot and click “Write a review.” Happy reviewing! The other nice recent addition is that you can see reviews that your friends have made by visiting their profile. It’s something that the team removed, but it has returned, luckily. Seeing reviews that others have left, if they want to expose that, is a great way to find new places to check out, and also plants the seed that you should also review a place to help the next person out. As far as ratings, or basically everything really, I don’t think in numbers, and I am more likely to rate a place that I’ve eaten at when presented with actual words to express my feelings. Unfortunately, there’s no option for “absolute suckage,” which is a phrase that I tend to use to explain a really bad experience.